Cleveland’s rich base ball heritage extended into the early 1860’s. After the Civil War, the game exploded across the nation, and the Western Reserve was no exception to this phenomena. It was only a matter of time before some sort of regional championship match was formed among the ball clubs budding all over the area. On October 20, 1865, the first match game of base ball in Ohio took place at Kinsman grounds (modern day corner of E. 40th & Woodland) at 4:00 pm. The two participating clubs, the Forest City’s and Oberlin Penfields, were the first two clubs on the Western Reserve. 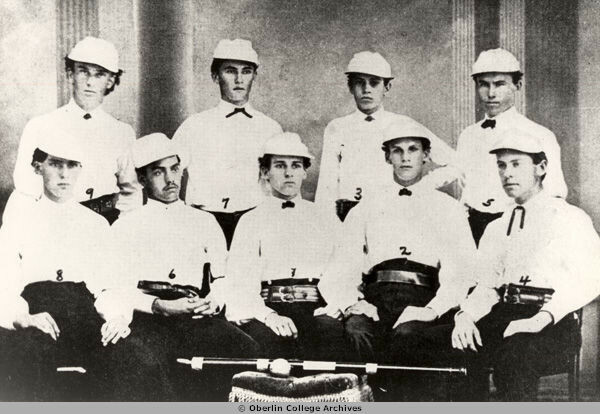 The Oberlin club was made up of Oberlin College players. The Forest City’s of Cleveland were a cricket club, that had just started playing base ball. There was a large crowd that day, numbering several hundred, as Forest City won the coin toss and elected to take the field. According to the book Base Ball on the Western Reserve, by James Egan Jr., the game was full of injuries. A.R. “Pikey” Smith lost a ball in the sun and ran into another player, losing two teeth. Cleveland’s left fielder hurt his arm while throwing and had to leave the match. A member of the Oberlin nine stopped a batted ball with his face and had to leave the match. Due to darkness, the game was finally called after the seventh inning, with a score of Oberlin 67, Cleveland 28. After the match, both clubs went downtown and enjoyed a good meal and drinks at Garrets Hall, on the Forest City tab. A post game meal and banquet was a base ball tradition for years in Cleveland and elsewhere. In 1866, the Forest City’s avenged their lopsided loss from 1865 with a 36-18 beating of the Penfields on July 4th in front of thousands of fans. A Silver Ball and Rosewood Bat, made by Tiffany’s Co., and valued at $120, was secured by John Sargent, a local merchant. The large sum for the prize was a year’s wages for most working-class families of the time. The trophy was open to all clubs from the Western Reserve area, and could only be won if a club played in at least one challenge match per month, and went undefeated in such matches for the entire season. A tradition was born, and the stakes were high. In 2009, the Western Reserve Championship was revived. 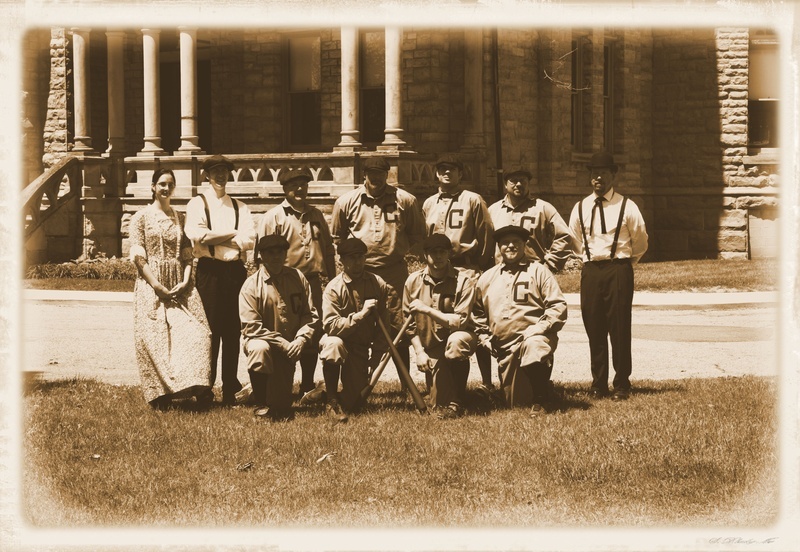 Matches were played between all three vintage base ball clubs in the area: the Akron Black Stockings, Forest City’s and Cleveland Blues. The matches were played at Lakewood Park, in Lakewood Ohio, and sponsored by the Lakewood Historical Society. A small trophy was made, and the event was deemed “The Western Reserve Cup”. The Cleveland Blues prevailed in 2009, after all clubs had played each other once. After the match, the clubs adjourned to Merry Arts Grille and Pub for refreshments. Each of the four clubs play an outstanding form of vintage base ball. The 2010 Western Reserve Cup Champion Akron Club was organized in 1995 and play out of Stan Hywet Hall. 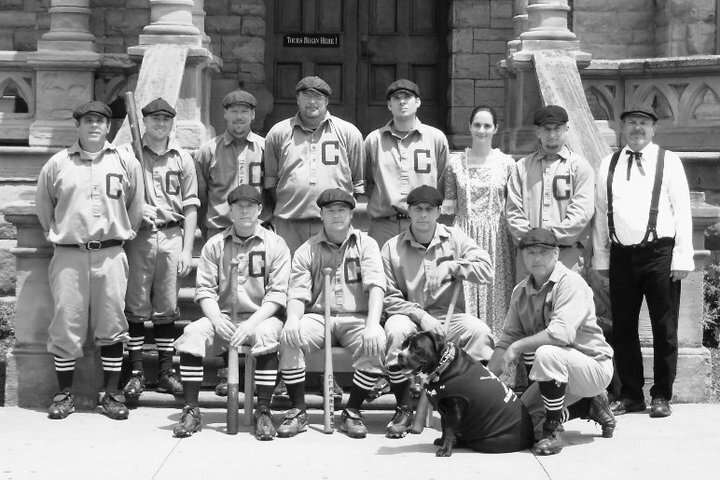 They have traveled all over the country playing vintage base ball, and host the prominent “Akron Cup”. The won the prestigious National Silver Ball Tournament twice, in 07' and 08'. Their seasoned ball players always play the game well, and rarely lose matches. The Forest City’s are patterned after the same Forest City’s who won the Western Reserve Cup in 1866 and 1867. They play out of Chagrin Falls, and have been a club since 1996. 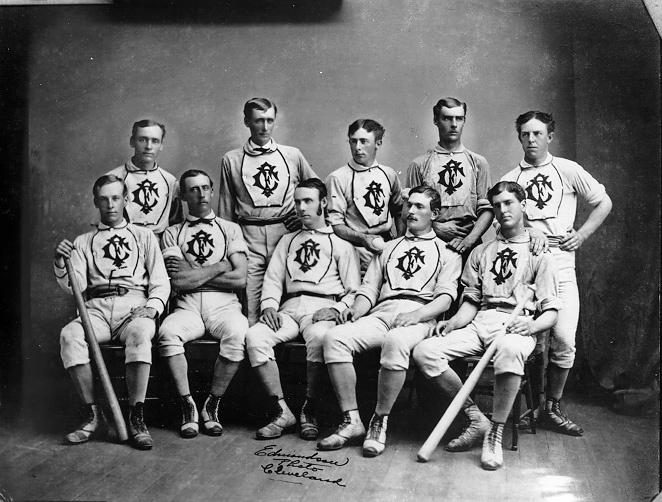 In 2009, the Forest City’s won the Reserve Champion Trophy at the World Series of Historic Base Ball, making them one of the premier vintage clubs in the country. The Cleveland Blues are based on the 1878-1884 Blues of the National Association. Founded in 2008, the 2009 season was their first year of play. The club plays out of historic League Park (E. 66th & Lexington) The Blues won the Western Reserve Cup in 2009, and the National Silver Ball Championship in 2010. The Whiskey Island Shamrocks began play in 2009, and play at various locations in the Cleveland area. They are named after a team that played in the mid 1880's. The annual event is sponsored by the Lakewood Historical Society. Please bring your lawn chairs or picnic blankets for the occasion. The matches are free and open to the public. Lakewood Historical Society will be selling food and drinks for all the kranks (fans), and all proceeds will go toward the society. After the match, feel free to join the Blues, Forest City’s, Black Stockings and Shamrocks at Merry Arts Grille and Pub – 15607 Detroit Ave. in Lakewood.